Meet wine expert Shane Jones. We’re being chauffeured through the crimson, gold, and russet vineyards of the Champagne region in France. Think New England fall foliage on a smaller scale. Autumn here is a glorious blaze of multi-coloured fields, as the meticulously pruned vines die off after harvest. I’m in the company of Grand Turk native and wine expert Shane Jones. He’s the holder of the prized Moet and Chandon scholarship for top marks in the sparkling wines’ exam of his diploma. A trip to two of the world’s top Champagne houses is his reward. 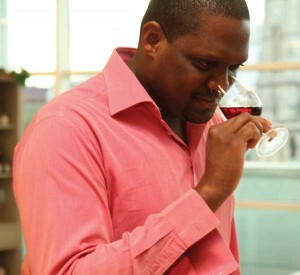 So how did this Turks & Caicos Islander find himself in the rarefied world of wine expertise? Shane Jones is shown “nosing” a glass of wine. Born in Grand Turk in 1978 to Hattie Francis and William Jones, Shane enjoyed a happy childhood in Overback, where his mother ran a small sweet and rum shop. He went on to H.J. Robinson High School where he came into his own. In fact his time there led to his first introduction to Europe. “I was part of the debating team and I played clarinet in the marching band. I was also a member of the scouts and travelled to the World Scout Jamboree in Holland in 1995,” he recalls. He may then have been unclear about his future career, but what’s obvious now is his extensive knowledge of wines. We’re at the splendid 18th century house, Le Trianon at Éparnay, with Yumi Laforge, Moet and Chandon’s Maison Ambassador. Originally the home of the Moet family, and then the Chandon family, the house hosted Napoleon Bonaparte on several occasions. After an aperitif of the world’s most popular Champagne, Moet’s Brut Imperial, in a beautifully decorated and mirrored salon, we’re guided to the library for lunch. Yumi and Shane begin an intense discussion of the merits of three rosé Champagnes which will accompany our food. It’s a long way from the library of the University of the West Indies in Barbados, from where Shane graduated in 1999 with a joint Economics/Accounting Honours Degree. Returning to Grand Turk he joined the Department of Economics and Statistics. “It was a broad- based experience focusing on project management, helping departments budget for major capital projects and preparing submissions for EU, UN, and Caricom funding.” After only a year he was approached to head up the Land Registry, where as Registrar of Lands he oversaw the transfer of all properties, registration of charges, collection of stamp duties, and fees. He brings the same attention to detail from that job to his new role. Shane has a particular interest in rosé or pink Champagne, whose popularity is increasing, although it’s still not taken seriously by many professionals. “Traditionally it was seen as a trivial drink for giggling girls, but if it’s aged impeccably and matched properly it can stand up to serious food,” he emphasises. The rosé Champagnes to complement lunch are from 1985, 1999, and 2006. Shane explains the difference to me. “The younger ones are more accessible to unexperienced palates beause the black fruit notes are obvious — plum, blackberries, and dark cherries. The older ones are more complex, and the terminology changes. For example, flavours may be described in “game” terms. It’s more difficult to assess, especially if people are unfamiliar with shooting wild fowl, and hanging it to intensify the flavour,” he explains. However the plan changed after two years in London, when he realised that he had the opportunity to add international experience to his CV. He worked for a number of property companies, advising international clients on luxury property investments in the Caribbean, France, and Croatia. Travelling through Europe he had the opportunity to visit vineyards and taste wine. But his first experience of wine bore no resemblance to our tastings at Le Trianon. “It was some time in the 1980s and it would have been a fruit wine, or a gallon container of an American brand like Gallo or Paul Mason. I can’t remember my first taste of wine or how old I was at the time, or even that I was immediately taken by it.” He only started to take wine seriously when he was working in the city of London in 2007. Bishopsgate Institute offered an introductory course, which he took during his Friday lunch breaks. His passion is obvious as he and Yumi discuss the finer points of the Champagne and food pairings at lunch. According to Shane the intensity of the wine matches the food perfectly, and the savoury flavours are drawn out. The 2006 is served with red mullet; the black truffle ravioli blends beautifully with the 1985 vintage; and the 1999 is paired with the lamb, which has been slow-cooked for seven hours. Shane’s mother, the late Miss Hattie, a great cook, was famed for her buds and rice, and souse. He understands and appreciates good food. His ease with his subject is down to a combination of experience and knowledge. In January 2012 Shane signed up for his first professional wine course, the Level 3 Certificate in Wines and Spirits at the Wines and Spirits Education Trust (WSET), a leading global provider of wine education. “I learned how to taste properly, to match food and wine. The main focus was an introduction to the world’s major wine regions. We tasted everything from around the world,” he says. He passed with distinction and won the top scholarship — the Vintners’ Bursary — which awarded him a travel bursary to visit any wine region of his choice. He spent ten days in the Ahr Valley, Germany to increase his understanding of Pinot Noir wine. The diploma was the next step and was more challenging. “It was about being more critical. You form an opinion and have to defend it. It helps to understand wine’s quality and authenticity. There’s more independent study, attending trade events, and reading trade publications. You have to know what’s happening in the marketplace to prepare you for understanding the business better.” Shane achieved a Merit in the diploma — the first Turks Islander to hold such a qualification. He also won the Moet and Chandon scholarship, which is what has brought us to France. The WSET qualification has opened up lots of career options for him. Diploma-holders work in the offices of wine importers and manage portfolios of producers from around the world, ensuring representation in leading bars and restaurants. They also work as journalists, brand ambassadors, marketers, and auctioneers in auction house like Christie’s. Shane takes a particular shine to sparkling wines. “I bought my first case of Champagne in Grand Turk over 15 years ago — I knew I liked it but it was years later that I made the effort to understand it better. The bubbles make it stand apart from anything else and it can be many different things — Champagne, cava, prosecco. I love the taste of it.” He enjoys quizzing winemaker, Pierre Casenave, at the Veuve Cliquot house in Rheims, about the technicalities of blending red and white wines for the perfect rosé composition. Afterwards we compare non-vintage and 2004 Veuve rosé Champagnes under the guidance of the charming Hospitality Manager and Ambassador Maison, Camille Berdin. Our tours of the cellars in the Moet and Veuve houses are an insight into the journey a bottle of wine takes to maturity. Moet’s cellars, the largest in the region, were carved out in the 17th and 18th centuries. They’re over 17 miles long. It’s a romantic experience to walk through, and imagine the various processes being done by candlelight, before electrification. “I like to think of all the delicious Champagne being stored in waiting. It’s like a caterpillar transforming into a butterfly. The yeast sediment is removed, it’s bottled and labelled. The bottle then takes off as an adult to be enjoyed in another part of the world,” Shane enthuses. For someone who’s new to wine he recommends sparkling wines because that’s what he loves. But he’s quick to point out that everyone has a different reaction to wine when they taste it. Shane’s most memorable reaction was to a Dom Perignon 1996 Champagne, at a Decanter magazine fine wine experience. “It was exhilarating and very overwhelming but so pleasurable. I can still taste the intensity of the wine. If I think of that wine I can taste it.” Dom Perignon is the Benedictine monk remembered in legend as the father of Champagne. We enjoy a glass of a 2006 Dom Perignon vintage, after the Moet cellar tour.